The evolution of tactical gear, packs and equipment available to us as preppers is astounding. We can get any kind of pack we want with MOLLE adaptability, special holsters, awesome knives and military grade clothing – sometimes as easy as hitting the local ranch and home store. It’s easy to get caught up in that flashy new product or revolutionary piece of equipment. 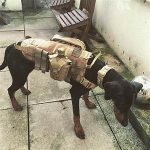 But sometimes we overlook some of the lesser-known tactical pieces of equipment available to us that could help our own faithful family members – the dogs. Listen to this broadcast or download “K9 EDC and Tactical Gear” in player below! So where do you find those key pieces of equipment? In most cases, pet stores will have some of the basics you can use for some of the training we spoke about last week. But to find the good stuff you have to dig a little deeper. 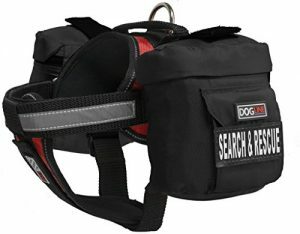 This week we will be going beyond the leashes and collars to find the real deal when it comes to tactical equipment to outfit your dogs. Just as tactical gear has evolved for us, the same has taken shape for dogs as their involvement in search and rescue, police and military work has become more and more prominent around the world. Join us as we share some of the best resources for the gear you can’t find in a traditional pet store as we unwrap our top ten best picks based on what we’ve been able to track down! With the holiday season upon us you may want to consider hanging one more stocking this year and stuffing it with an item or two for your four-legged family member! Also, don’t miss out on our Pint-Sized Prepper Project of the Week where we show you how to make household dog biscuits out of everyday pantry items and why it’s important to know how to make your own animal treats! Previous: Previous post: Sleep Deprivation! Next: Next post: Mobile Device Apps for Radio Communications Preparedness!